The UberScoot 1000 watt 36 volt electric scooter continues the legacy of superior engineering the EVO name pioneered. Quality components all the way through. Tight, hands on quality control throughout the manufacturing process delivers an electric scooter that does what it's supposed to do .... when it's supposed to do it. 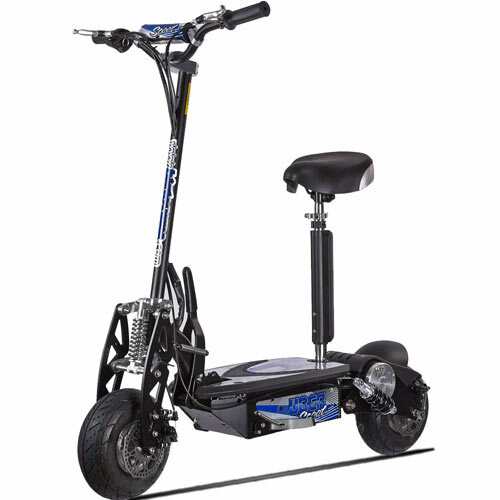 The UberScoot 1000 is designed for mid teen and adult riders. Built for everyday use. 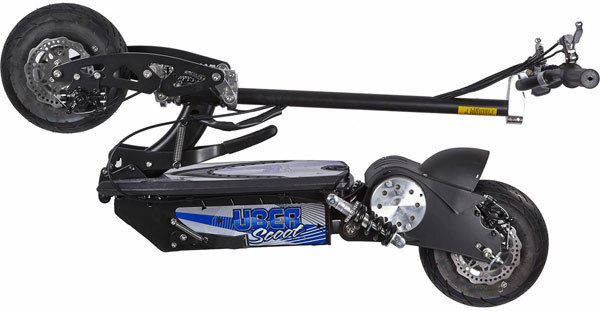 The UberScoot 1000 watt motor is manufactured with rare earth magnets, superior bearings and motor overheat protection built in. With batteries fully charged the UberScoot 1000 watt motor develops 1.3 hp. giving the UberScoot 1000 performance that rivals many folding gas scooters. A remarkable technological achievement in such a small, quiet power package. Rear Fender is rigid ABS has steel rib underneath. Resists cracking and breakage. Can be used as rear handle. UberScoot 1000 watt electric scooter uses three, rechargeable, 12 volt 12 amp hour, SLA batteries as the power source for it's 36 volt system. These larger 12 amp hour batteries can store and release about 20% more power than the commonly used 10 amp hour power packs. Battery pack unplugs and lifts out of scooter easily. UberScoot 1000 watt scooter sports an all steel frame featuring total weld design not the cheaper Tack joint method. Welded steel battery and electronics cradle. This Puzey design frame and suspension configuration maintains it's original integrity far longer. Fully active and easily adjustable suspension can handle riders of different weight according to their personal preference. Shocks are located to "flex" directly under the rider seat greatly improving rider comfort. Upgraded, larger drive chain to handle the increased power and torque. Rear Suspension is swing arm with coil over shocks, one on each side. Both rear shocks are fully adjustable to give you the ride that fits you best. One piece, all steel rear trailing arms provide superior stability. Wide 3.75x10 inch pneumatic street tires with tread over design. The UberScoot 1000 electric scooter can be ridden standing or seated. Quick remove seat is wide, has springs and is fully adjustable. Real disc brakes with vented rotors front and rear. Tough ABS deck resists damage. Deck lifts from rear for easy access to main fuse, batteries and scooter electronics. UberScoot 1000 BMX style handlebars are loaded with options. Options like the "Power Interrupt Feature" Squeeze the rear brake lever and the on board computer automatically "interrupts power to the scooters motor increasing safety in quick stopping situations. Handlebars can be loosened and rotated forward or backward to meet your personal comfort requirements. Conveniently located key operated ignition There's More! The UberScoot 1000 watt 36 volt electric scooter features an economy mode button. This mode will slow down acceleration and top speed to conserve battery life for those long rides. Power reduction mode is also very helpful for an entry level rider. Control button is conveniently located next to throttle. Thumb operated. To return to full 1000 watt power mode simply press the button at any time. Your new UberScoot 1000 arrives at your door encased in fitted foam and placed inside of a thick cardboard shipping container ensuring your new UberScoot 1000 watt electric scooter arrives in new condition. Your new UberScoot 1000 arrives at your door 99.9% assembled! Insert one of the main fuses that came with your UberScoot 1000 into the fuse holder located under the foot deck. Assemble seat to post and place onto support receptacle at rear of deck. A handy tool kit is included. Massive 1000 watt rare earth magnet motor delivers incredible power. Max useful load: 265 lbs. Max Frame Load: 300 lbs. Batteries: Three 12 volt, 12 amp hour, SLA batteries. Removable Battery pack. Unplugs and lifts out quickly and easily. Charger Included: Yes. Uses regular household electricity. Pennies a charge. Drive System: Chain, E-Z adjust. Real suspension , The New front suspension is the latest innovation on this top of the line electric motor scooter. As the front wheel travels up or down over bumps exact front end geometry is maintained increasing controllability and rider enjoyment. Multi-Function LCD Indicator, located on handlebars, tells you the status of your batteries while riding and performs certain diagnostic tests or warning functions (see owners manual for details). 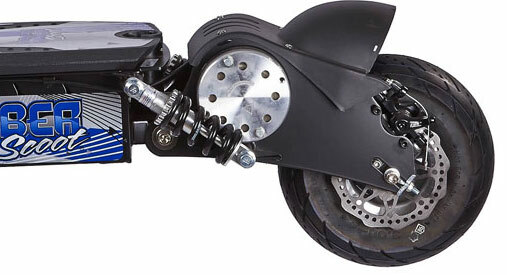 Rear Suspension is swing arm with coil over shocks, one on each side. Both rear shocks are fully adjustable to give you the ride that fits you best. Brakes front and rear are disk. Calipers are real not just look alike. Easily adjustable. Rotors are high quality heat treated steel, sculptured and vented for faster and more even heat distribution. Pads are large area, high quality and scorch resistant. Best system you can buy on a folding electric motor scooter. Seat hight adjustment range 8"
Stylish seat post and handlebar wrap included Free. Product Size: Length 44", Height 42" Handlebar width 25". Click the button below to add the UberScoot 1000 watt 36 volt Electric Scooter to your wish list.